The day started with 26 players all with the same subtly strong thought of “I could win a bracelet today”. Only one of those players didn’t get their hopes up, and that player was Joey Weissman. It only took 2.5 levels of play to reach the final table with Vanessa Selbst, Adria Balaguer, Larry Duplantis, and Jimmy Fradettedufour all making early exits. We reached our ten-handed unofficial final table with the elimination of Stephen Reynolds. Ten-handed play didn’t last long with William Reynolds being crippled early on and eliminated shortly after. Once the eight players were reached play slowed down considerable, with most hands consisting of stealing the blinds and antes. Soon though the blinds rose up and players started to fall to the wayside. Konstantin Puchkov, Joshua Pedraza, Michael Gagliano, and Joe Gualtieri all took their exits and we found ourselves five handed. Five handed play consisted of Weissman playing almost every hand and short stacks doubling up every so often. 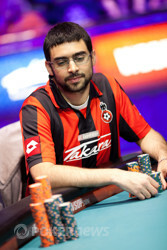 Five handed play couldn’t last forever though and we finally had an elimination when Bradley Lipsey’s queens ran into Weissman’s aces, causing Lipsey to be our fifth place finisher. A few hands later after Lipsey left, Philip Meulyzer was knocked-out. Twenty minutes after that saw the fall of Fernando Brito. Joey Weissman came into the day with the chip lead and never looked back. Weissman’s day started off in the right direction, delivering the knock-out blow to the most feared player left in the tournament Vanessa Selbst. Weissman continued his rush, single handily knocking out Joshua Hillock and Mark Schmid. Weissman was involved in many pots early on, and had a reason to do so; he was winning almost every hand. A crowd of Weissman fans began to shuffle in little by little, and by the time the final table was reached Weissman couldn’t steal the blinds and antes without thunderous approval from the crowd. Weissman continued to put pressure on every single player throughout the day. Almost every hand came with a raise from Weissman, and players consistently folded to stay out of his way. If Weissman were to raise and get rebuffed by a three-bet he would fold, and come out of the gates raising again the next hand. Once Weissman reached heads up play it looked as though he would be able to over power Jeremy Quehen like he had everyone else who played. Quehen was resistant though hovering around 3,000,000 for most of heads up play. Near the end of the last level of play though Quehen won a double up to put himself in better position. A few hands after that he exploited a flush and overtook the lead. Then when it looked like Weissman was going to come up second best, he doubled up. Players were then basically even for the first time of the night. They wouldn't be even for long, as Weissman managed to get all his opponents chips in while holding the best hand. 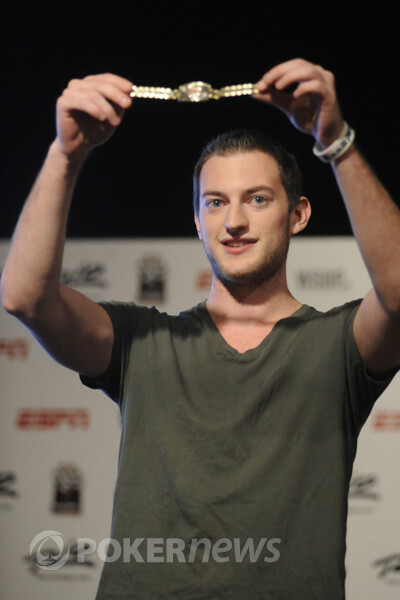 Joey Weissman defeats Jeremy Quehen to win the WSOP Gold Braclet. Weissman had a raucous rail, that included, Revis, the service dog. 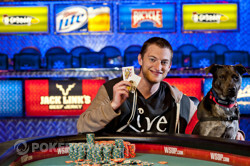 Joey Weissman has just become a World Series of Poker (WSOP) bracelet winner and this is how it went down. Weissman raised to 240,000 and Jeremy Quehen made the call. The flop was and Quehen decided to lead with a bet of 350,000. The motion took Weissman a little by surprise but he made the call. The turn card was the and Quehen continued his assault with a 800,000 bet. 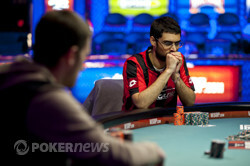 Weissman was riffling a pile of orange 5k chips while he pondered his next move, which was to make the call. The final card in this amazing hand was the . "2 million," said Quehen before moving four towers of green 25k chips across the line. Back to Weissman and he really did look nervous. Then when everyone was expecting him to fold he announced that he was all-in. Quehen called instantly and Weissman threw the onto the felt and the whole place went nuts. Weissman was swarmed by his fans (and the dog) and he was so deep under we couldn't see him. What an amazing comeback from a man who had led for the entire day. Commiserations to Jeremy Quehen who we are sure we will see again in the very near future. "Tonight we are getting fu**ed up!" Shouted Weissman's friend. Good for you lot, you deserve it. Jeremy Quehen raised it up from the button and made it 240,000 to see the flop. Joey Weisseman made the call and both players were witness to a flop. It was here that Weissman check-called a bet of 300,000. The on the turn saw a repeat of action with another check-call from Weissman, this time for 420,000. A river brought two checks and cards were tabled. Both of them had and the pot was chopped up. Both players are now basically even in chips. Someone just woke the American rail up! That's right Joey Weissman just woke the American rail up! 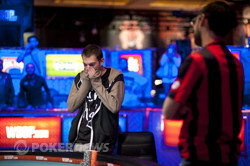 Jeremy Quehen raised to 240,000, Weissman moved all-in and Quehen made the call. Weissman doubled up to 6,540,000 and this match is neck and neck with forty-five minutes to play before it ends for the night. Apparently the players are going to play another level, making this one the last level of the night. Oh, how quick things can change in poker. The atmosphere has changed from a super charged American sing-song to a French revolution. The once super-confident Joey Weissman looks nervous and down beaten, and his once charming rail are now throwing insults at the young Frenchman, who is soaking in every word and growing in stature and confidence. The red, white and blue is now bleu, bleu, bleu! Quehen raised to 200,000, Weissman three-bet to 500,000, Qehen made it 1,000,000 and Weissman folded. 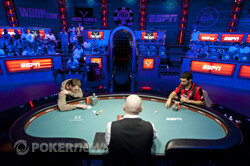 Quehen showed the room the lone which resulted in a few comments from the rail. Then Weissman raised to 200,00 and Quehen made the call. The flop contained more clubs than the streets of Ibiza Town - . Quehen checked, Weissman bet 250, Quehen check-raised to 650,000 and Weissman called. The turn was the and Quehen made a bet of 750,000; Weissman called. The final card was the and this time Quehen made it 1,750,000 (the biggest bet we have seen bar an all-in) and Weissman made the call. Quehen leapt to his feet and threw the triumphantly onto the table. The French rail rose in unison and French chants filled the air. Quehen is the new chip leader with 9.2 million and it is the first time for a very long time that Weissman has had to play with the inferior stack. Jeremy Quehen moved all in from the button for 2,600,000. Joey Weissman looked at his cards and started contemplating if he wanted to call. After a few more moments Weissman made the call. The flop came and with that Quehen's two pair were best and he was awarded the double up.